Are You Going To Eat…….Rainbow Carrots – Food. Boom. 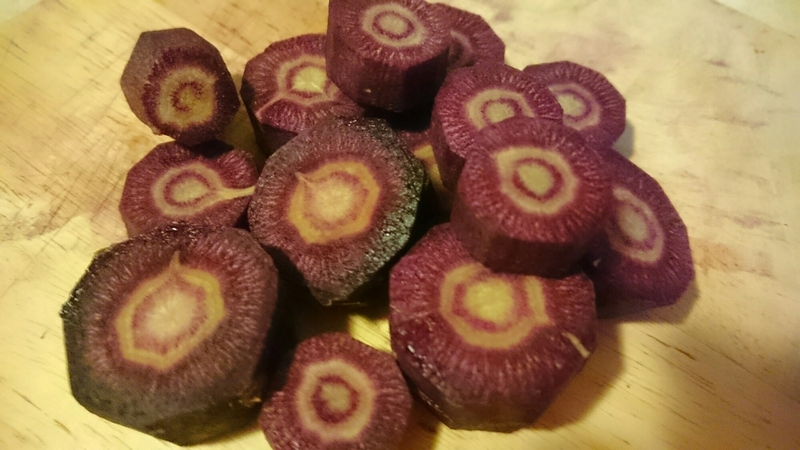 Rainbow Carrots -ultra bright variations on the usual orange variety to be found on farmers market shelves everywhere. Debatably higher in anti oxidants and unarguably prettier on the chopping board, we couldn’t resist trying these out. Point number one -they are considerably dearer than their orange cousins, roughly triple by weight. We tried them roasted, raw and mashed. Point number two -the pretty factor disappears on cooking to an uninterrupted dark blacky purple. Point number three -they taste of more nothing than you could possibly imagine. A raw strip has a subtle, earthy hint reminiscent of a very weak beetroot but cooking annihilates everything but texture. Am I going to eat rainbow carrots? No. I shall spend the money I save on some humble orange ones on a nice fresh beetroot instead. Tags: Vegetables; rainbow carrots; foodCategories: Are You Going To Eat That? PreviousA sad customer’s plea to the commercial smallholders.